Breeze through your 2-year renewal exam with Gold Seal! The FAA requires Remote Pilots to renew their Remote Pilot certificates every 24 calendar months. This involves an FAA knowledge test similar to your initial test, but abbreviated and more heavily weighted toward airspace and sectional chart issues. Gold Seal makes it easy and affordable to get the refresher you need to prepare for your recurrent exam! UAV Ground School has over a dozen video and interactive lessons divided into three sections. Access the program at any time, 24/7, on any computer with internet access. It reviews all the essential and helpful information you'll need to breeze through your recurrent exam, and includes a Practice Final Exam to up your test-taking game for Exam Day! 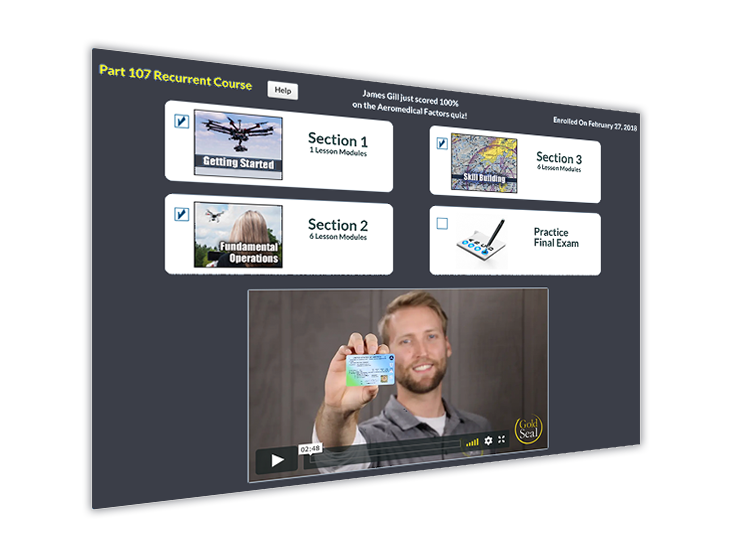 The Gold Seal Recurrent Test Prep course contains our trademark Knowledge Transfer System also used in the full UAV Ground School. It's optimized to get you ready for the Recurrent Test as quickly and easily as possible using our unique and proven system. The FAA requires you to take the recurrent exam every 2 years, but you shouldn't have to pay to study every time. Once you enroll in our Recurrent Test Prep you'll have access for life, so you'll never have to renew your membership to study for each recurrent exam. And since we're constantly updating our lessons, you'll know you're always getting the most up-to-date information so you can excel when you take your exam.